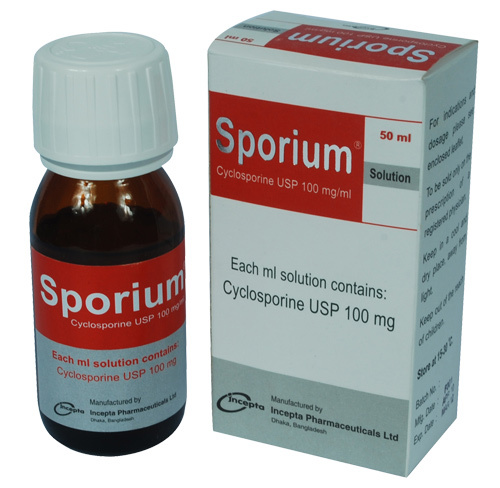 Sporium solution: Each ml solution contains Cyclosporine USP 100 mg.
Cyclosporine is a cyclic polypeptide consisting of 11 amino acids. It is a potent immunosuppressive agent, which prolongs survival of allogeneic transplants of skin, heart, kidney, pancreas, bone marrow, small intestine or lung. Cyclosporine acts specifically and reversibly on lymphocytes. Unlike cytostatic agents, it does not depress haemopoiesis and has no effect on the function of phagocytic cells. Patients treated with Cyclosporine are less prone to infection than those receiving other immunosuppressive therapy. Solid organ transplantation: Initially 10 to 15 mg/kg given in 2 divided doses starting 12 hours before surgery and to continue for 1 to 2 weeks post-operatively. Maintenance dose should be gradually reached to 2 to 6 mg/kg given in 2 divided doses. Bone marrow transplantation: Initially 12.5 to 15 mg/kg given in 2 divided doses, starting on the day before transplantation. Maintenance treatment of 12.5 mg/Kg in 2 divided doses should be continued for at least 3 months (and preferably for 6 months) before the dose is gradually decreased to zero by 1 year after transplantation. Endogenous uveitis: Initially 5 mg/kg per day orally given in 2 divided doses are recommended. For maintenance treatment, the dose should be slowly reduced to the lowest effective level. Nephrotic syndrome: Initially 5 mg/kg for adults and 6 mg/kg for children given in 2 divided doses. In case of renal impairement, the initial dose should not exceed 2.5 mg/kg per day. For maintenance treatment, the dose should be slowly reduced to the lowest effective level. Rheumatoid arthritis: For the first 6 weeks, the recommended dose is 3 mg/kg per day in 2 divided doses. To achieve full effectiveness, up to 12 weeks of Sporium therapy may be required. For maintenance treatment, the dose has to be titrated individually according to tolerability. Psoriasis & Atopic dermatitis: Initially 2.5 mg/kg per day orally given in 2 divided doses and 5 mg/kg per day for patients whose condition requires rapid improvement. For maintenance treatment, doses have to be titrated individually to the lowest effective level. Nervous system: Tremor, headache, paraesthesia. Gastrointestinal tract and liver: Anorexia, nausea, vomiting, abdominal pain, diarrhoea, gingival hyperplasia and hepatic dysfunction. Metabolic: Hyperlipidaemia, hyperuricaemia, hyperkalaemia, hypomagnesaemia. Musculoskeletal: Muscle cramps, myalgia and rarely muscle weakness, myopathy. Haemopoietic: Usually uncommon but anaemia, thrombocytopenia can occur. Skin and appendages: Hypertrichosis and allergic rashes. Cyclosporine increases the risk of developing lymphomas and other malignancies, particularly those of the skin. So patients should be warned to avoid excess ultraviolet light exposure. Cyclosporine may develop bacterial, fungal, parasitic and viral infections. So therapeutic strategies should be employed for long-term immunosuppressive therapy. A reversible increase in serum creatinine and urea may occur during the first few weeks of Sporium therapy and usually responding to dose reduction. In elderly patients, renal function should be monitored with particular care. Regular monitoring of blood pressure is required during Sporium therapy; if hypertension develops, appropriate antihypertensive treatment must be instituted. Cyclosporine enhances the risk of hyperkalaemia, especially in patients with renal dysfunction. Caution is also required when Cyclosporine is co-administered with potassium sparing drugs. Cyclosporine enhances the clearance of magnesium. If considered necessary, magnesium supplementation should be given. Caution should be observed in treating patients with hyperuricaemia. During treatment with Cyclosporine, vaccination may be less effective; the use of live-attenuated vaccines should be avoided. Non-transplant patients with impaired renal function, uncontrolled hypertension, uncontrolled infections, or any kind of malignancy should not receive Cyclosporine. Pregnancy: There are no adequate and well-controlled studies in pregnant women and, therefore, Sporium should not be used during pregnancy unless the potential benefit to the mother justifies the potential risk to the foetus. Lactation: Cyclosporine passes into breast milk. Mothers receiving treatment with Sporium should not breast-feed.